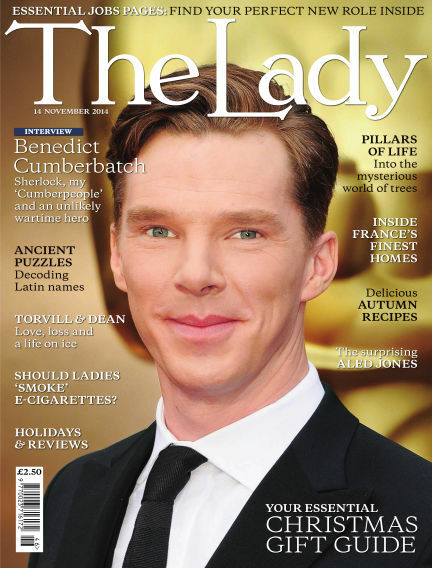 In this issue of The Lady : It’s not every day that one gets to star in a critically acclaimed film about wartime codebreaking genius Alan Turing and get engaged. And yet that is exactly how Benedict Cumberbatch’s November started. As well as bringing to life the brilliant but tragic mathematician in The Imitation Game, which opens today, Mr B.T. Cumberbatch last week announced his engagement to girlfriend Miss S.I. (Sophie) Hunter via the rather traditional method of a classified advertisement. And as if that weren’t enough, he’ll be returning as that ‘most specially greedy, strong and wicked worm’ in the final Hobbit film before Christmas, and as... drum roll, please... Sherlock, Hamlet and Richard III after that. We speak to him on page 14. We have Thomas Blaikie on the etiquette of that terribly mod- ern new fad, electronic cigarettes (to vape or not to vape? ); an insight into the weird, wonderful and hugely colourful world of Latin names; and we also embark on a journey into the magical realm of our trees. There’s Torvill and Dean (yes, we speak to them both) on love, loss and their lives on ice; some deliriously delicious recipes for bacon lovers; and part two of our essential Christmas gift guide. Plenty, then, to keep you out of the cold and in the warm em- brace of your favourite armchair. I do wish the cat would stop scratching mine. With Readly you can read The Lady (issue 14th November 2014) and thousands of other magazines on your tablet and smartphone. Get access to all with just one subscription. New releases and back issues – all included.